Boryspil International Airport is main gateway for flights to Kiev and Ukraine. Situated around 19 miles east of the city centre it offers direct flights from most European capitals plus other cities such as New York, Dubai, Bangkok, and Beijing. Domestic flights from cities such as Dnipropetrovsk, Donetsk, Kharkiv, Luhansk, Lviv, Odessa, and Simferopol are also available. Kyiv International Airport (Zhulyany) is the city’s other airport and serves as the base for airlines such as Wizz Air and UTair. Flights from the UK, Italy, Russia, Germany, Poland and several Ukrainian cities are offered. Travelling to Kiev by train can be a lot of fun and is a great way to meet Ukrainians and other travellers. There are direct international trains from Moscow, St Petersburg, Bratislava, Budapest, Minsk, and Sofia. All arrive at Kiev Train Station in the city centre. Trains run between Kiev and most cities and large towns in Ukraine. Overnight trains from Odessa and express day trains from Lviv (5 hours) Dnipropetrovsk (5 hours), and Kharkiv (4½ hours) are just some of the options available. International buses to Kiev from throughout Europe are offered by companies such as Ecolines and Eurolines. Bus services between Kiev and other Ukrainian cities and towns are excellent. There are numerous bus stations in Kiev, though most international and intercity services use the Central Bus Station on Moskovska Square. 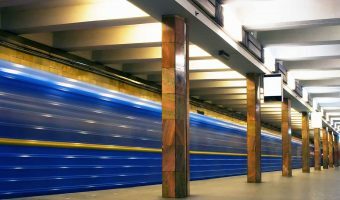 The Kiev Metro system is efficient and extremely cheap. Three lines and more than forty stations give rapid access to most major tourist attractions and hotels. Trains run every day from the early morning until midnight. Areas of the city not served by the Metro can almost certainly be reached using other modes of public transport. Trolleybuses, trams, buses and marshrutkas ply hundreds of routes throughout the city. Taxis in Kiev are fairly cheap as long as common sense is used. Avoid the crooks hanging around popular hotspots and call the operator direct if possible. The Kiev Funicular offers a memorable way of travelling between Podil and the city centre. All the major international car rental companies now have operations in Kiev.